In 8-inch skillet, heat oil over medium heat. Add spinach; cook 2 to 3 minutes, stirring frequently, until wilted and tender. Cool slightly. In medium bowl, beat egg. Stir in feta cheese, ricotta cheese, dill, salt, nutmeg and pepper until well blended. Stir in cooked spinach. Heat oven to 400°F. Remove pie crust from pouch; place crust flat on lightly floured surface. If necessary, press out folds or creases. With 2 1/2-inch round cutter, cut 12 rounds. Repeat with second crust. Press rounds in bottom and up sides of 24 ungreased miniature muffin cups. 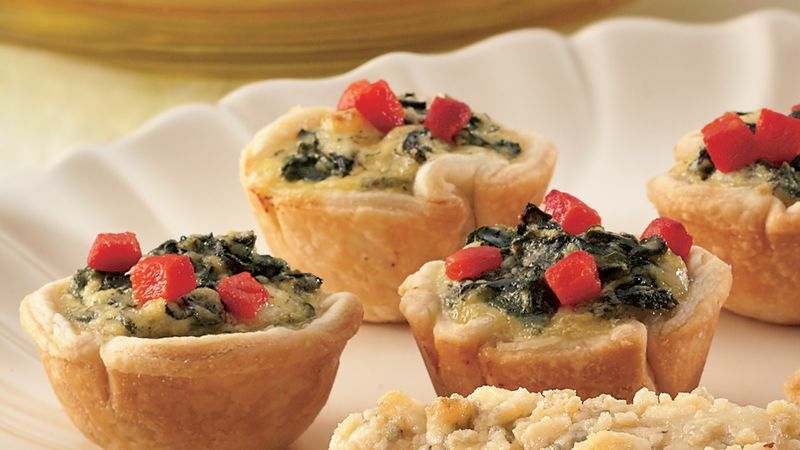 Spoon 1 rounded tablespoon spinach mixture into each pie crust-lined cup. Bake 13 to 18 minutes or until filling is set and edges are light golden brown. Cool tartlets 5 minutes; remove from pans. Garnish with pimiento. Serve warm. Feta cheese comes in flavored as well as plain varieties. Using flavored cheese reduces the need for extra seasoning. Look for flavored feta, such as tomato basil, in the deli or dairy case. If you choose a flavored feta, eliminate the dried dill weed and nutmeg in this recipe.